NSSLGlobal is enhancing their value-added service proposition with the launch of CrewVision, an on-board video-based entertainment system. This follows NSSLGlobal’s recent acquisition of Norwegian IPTV company snap.tv, one of the foremost providers of such systems, to develop new entertainment products and enhance crew welfare. 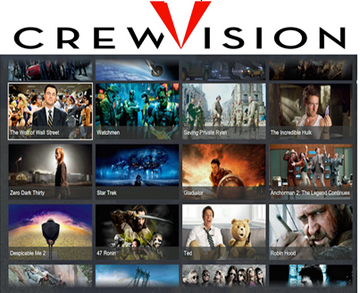 CrewVision provides an extensive range of new and classic Hollywood movies, box sets, documentaries, world-wide news and sports summaries for crews to enjoy. Maritime companies choose and pay for specific ‘content packages’, which are viewable via HDMI TVs, tablets and PCs. As well as encouraging communal activity, the system also has the potential to reduce internet usage by individuals in their cabins as the content is streamed separately over the satellite via NSSLGlobal’s multicast technology, without affecting the on board internet speeds. The system also has a content refresh capability, which seamlessly updates the movie and TV catalogue each month across NSSLGlobal’s VSAT IP@SEA service. New movies are typically available to customers just 6-8 weeks after cinematic release, allowing crew to stay up to date with the latest blockbusters while at sea. Andrew Sirkett, Marine Commercial Manager, NSSLGlobal, noted that with MLC-2006 regulations in place, there is now a requirement for shipowners to enhance the working environment and boost crew morale. What’s more, crew are expensive to replace and re-train, and many, particularly younger crew members, are unused to extended periods without access to Internet and entertainment services. A simple, yet cost-effective, way to enable this is by giving crews access to a wide range of TV programs and films via a service such as CrewVision. This, in addition to NSSLGlobal’s Crew Unite service, ensures that crew have access to entertainment without affecting on board internet speeds.